Fetch is made from a fuzzy, white material covered in black spots. He has large blue and black button eyes, a black button nose and black, fuzzy ears. At catching frisbees I’m #1! Fetch the Dalmatian was introduced on 1st January 2011. This is the regular 6″ version of Fetch. 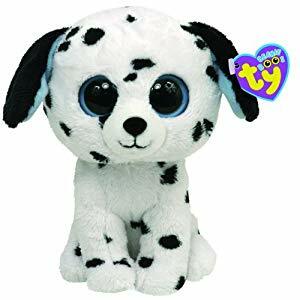 He was also released as a larger 9″ Beanie Boo Buddy and as a key clip.